First, meet the Porkulator. The Porkulator is legendary, now in its 21st year of existence. It was created in late summer of 1994. I had just resigned from a job and decided to take five weeks off before starting my new job. I had been working long hours, and most weekends, for the last three years, and so I was going to catch up on projects around the house to clear my head for a fresh start. He explained how he had just purchased a new welder and he was experimenting with it. Here was a perfect chance for me to learn to weld and build a barbecue. The seed was in fertile soil. I pondered the idea for a few days, and came to the conclusion that I could, in fact, get my list of chores done AND build a barbecue. I gathered an old oil tank from my childhood home (I had already cleaned it out many years before because my dad wanted to use it as a composter). A broken down homemade trailer from my dad and a cast iron pot-bellied stove from the house we were living in at the time. All of that stuff was free. I did end up buying a lot of metal, hardware, and welding supplies. I went through a load of saw blades, drill bits, and gloves. It took shape. 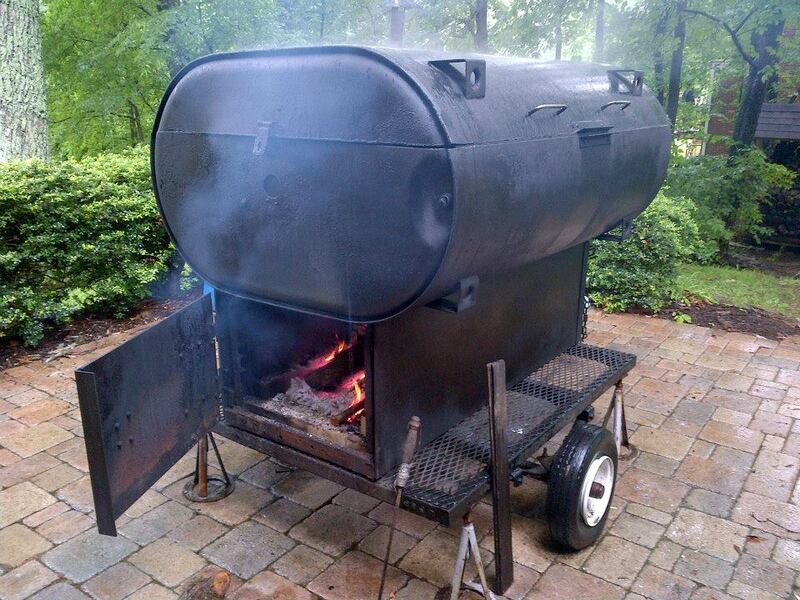 Jim said, a barbecue has to have a name, so he dubbed it The Porkulator. In just three weeks, the Porkulator was alive! We put it to use right away. There are too many epic tales of Porkulation to tell here. There were pig roasts, Thanksgiving turkeys, rib feasts, a banana leaf wrapped goat. There was cheese, nuts, salmon, trout, and oysters. Smoked salt, smoked peppers, smoked brewing malt. Homemade sausage and bacon. Bacon! Cords of apple, oak, hickory, and pecan wood were consumed in flame. You build something like this, and you use it. A lot. Every special holiday or event, every out of town visitor, every party, they all meant Porkulation. I did quite a bit of experimentation to figure out what worked best for certain types of barbecue. The culmination of my turkey experiments are given in the Washington Post article on me (April 2010). I did a whole summer of rib experimentation: different breeds of pigs, baby back vs spare rib, spare ribs whole vs trimmed St Louis style, membrane off or on, brined or not, different rubs, different mops, different sauces. 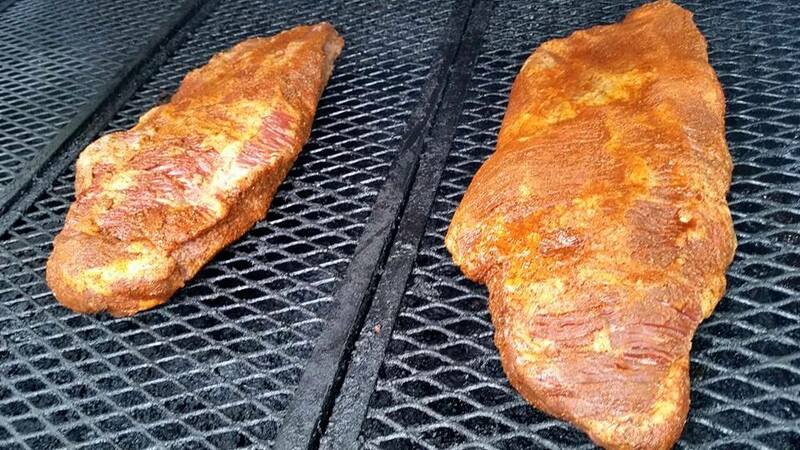 I’ll keep you hanging on the results of that fun because we are here to talk about brisket today. Years ago, I was determined to make delicious Porkulated brisket, and learn how to do it the same way every time. We ate a lot of brisket during the experiment. If I came to a pot luck, chances are I had a crockpot full of brisket with me. You need to start with a whole brisket. Not the flat cuts that you normally see in the meat department of the grocery store or Costco. 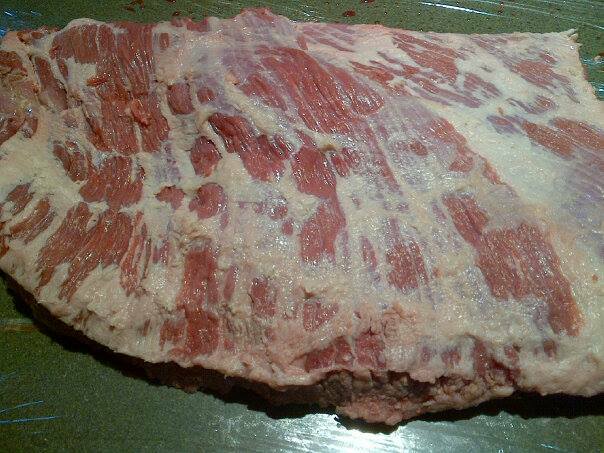 A whole brisket includes the flat cut and the point cut as a single piece. It’s a massive slab of meat usually weighing about 15 pounds. If you’re going to the trouble to cook one, you might as well cook two. I have cooked all kinds of different whole briskets from American Wagyu to run of the mill briskets from Walmart (yes, Walmart carries whole briskets from time to time). The Wagyu is really good, but you can get results from a standard brisket that probably do not justify the cost of Wagyu. 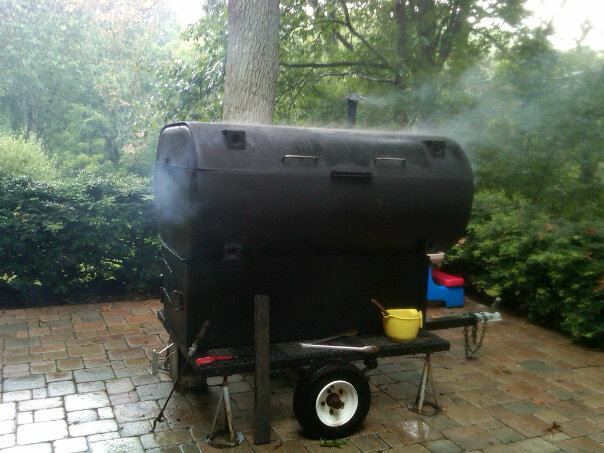 A 60 pound case of USDA Choice Angus briskets costs about the same as a 12 pound Wagyu brisket. I look for the heaviest briskets first, then I sort them by which ones have less fat and more meat, and finally sort by the ones that have the thickest flat cut. If a brisket is thick on the point end and very thin on the flat end, the flat end will get dry before the point is ready. You can cheat with foil, but if a piece of meat can be selected to cook properly from the start, that is the one you want. Buy two. The day before I cook my briskets, I trim and rub them. I spread out plastic wrap on the counter, and place the whole brisket in the middle. With a variety of small, very sharp knives, I trim off as much fat as possible. I also trim the edges of the meat where it is a bit discolored sometimes. Trim the fat that is between the flat cut and the point cut. Leave the two cuts attached, but cut away all of the solid white fat between them. From one whole brisket, I usually get enough fat to fill a gallon freezer bag. I save this to render and make soap or bird treats. 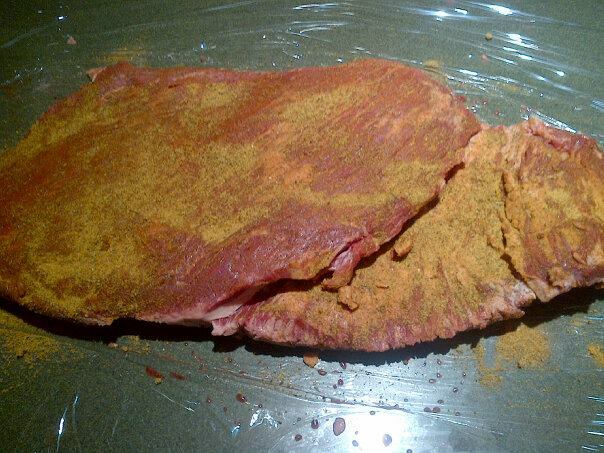 Next, generously rub the brisket on all sides and between the two cuts where you removed the fat. 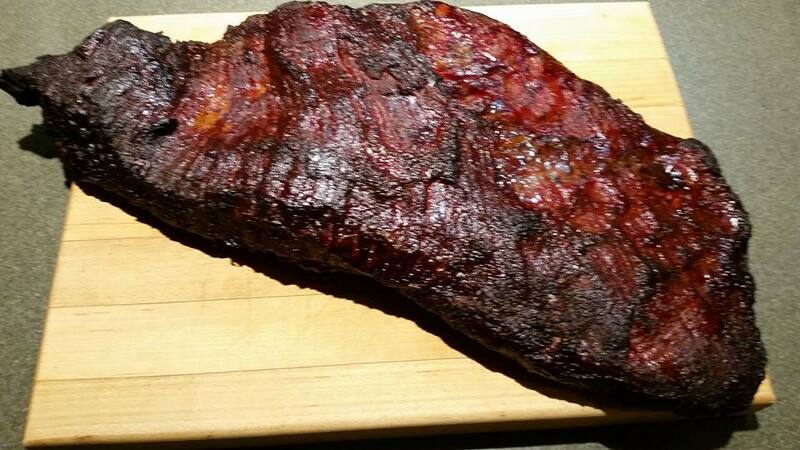 I’ve tried lots of brisket rub recipes and experimented with my own. I really like the prepared rub from South Texas Spice Company. 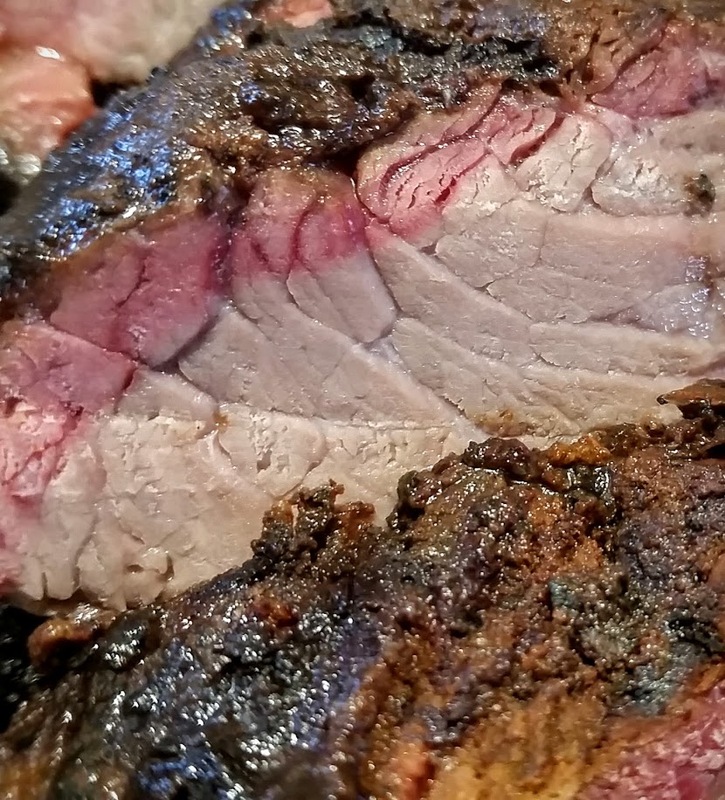 I generally add some fresh ground black pepper to it, but their rub has a nice flavor, it includes papain, the natural tenderizer from papaya, and it is milled as fine as dust so it gets in every crevice of the brisket. Wrap the plastic from the counter around the beef, put it in a sheet pan or food tray in case it leaks, and refrigerate. Rubbed. See how the two cuts of the whole are together? Point is on the bottom here. The next day, I get up as early as I can, usually when it just starts getting light. Get a big cup of coffee and go build a fire. I burn two or three logs at a time to build up coals. I don’t want the Porkulator to get too hot. Once there is a good bed of coals, I feed the fire with one or two logs at a time. I can tell the temperature inside by laying a hand on the lid. It stays a pretty consistent 250F inside. If it gets a little too hot, then I adjust the fire, moving wood out of the flame. If it’s too cool, then just add wood. You don’t want a lot of flame, but there has to be some. Too much flame will make the meat black and can make a bitter taste. 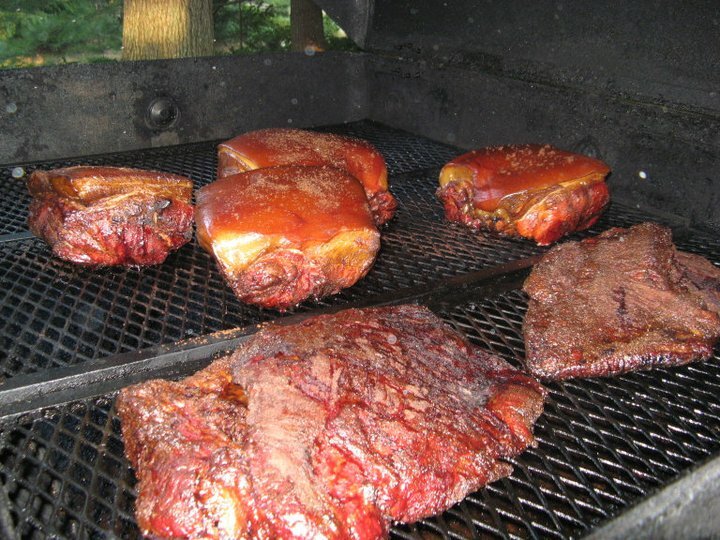 A wood fired barbecue requires using all senses to keep on track. The original pot-bellied stove gave out years ago as a result of too many fires and being left out in the weather. The Mark II version has a hearth of fire bricks on the trailer bed, and is enclosed with ¼” plate steel. Inside the Porkulator is another plate of steel between the fire and the expanded metal grills. The fire is about 30” below the grills and separated by the steel plate. Heat and smoke are evenly dispersed. When the fire is ready, the meat goes on the grill. Point cut lays on top so its fat marbling will melt and soften the lean flat cut. Now, the waiting. I maintain the fire at a consistent level. I usually keep a mop of beer, cider vinegar, salt, pepper, and crushed red pepper on hand, and mop from time to time, especially after adding a new log. 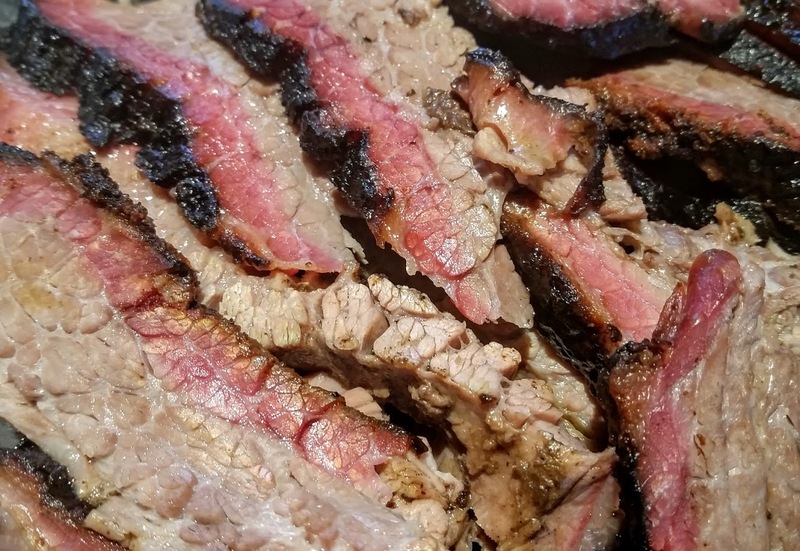 It takes up to 15 hours for brisket to be transformed to tender, juicy goodness. 170F is the internal temperature that needs to be struck, but I sense doneness by the look and feel of the meat. I can tell when the edges look a little burnt, and the meat starts to separate. Little morsels can be pulled from the edge of the flat. If it looks like it’s cooking too fast, then cool it down or wrap the meat in foil to continue at a slower pace. If you use foil, use it only for the last hour or two. More than that and the meat will not be able to be sliced. It will just fall apart, and will need to be served chopped. Let the finished brisket rest for a good two hours after removing from the grill. I cover with foil in a pan so the cool down is gradual and juices are retained. The meat will still be plenty hot to serve. Slice the point off of the flat cut and then slice across the grain. Lay out the slices in a pan. I make some slices ½” thick and others 1/8” thick. I cut some smaller and some the whole way across. That way folks can portion themselves as they like. Good brisket requires no sauce. 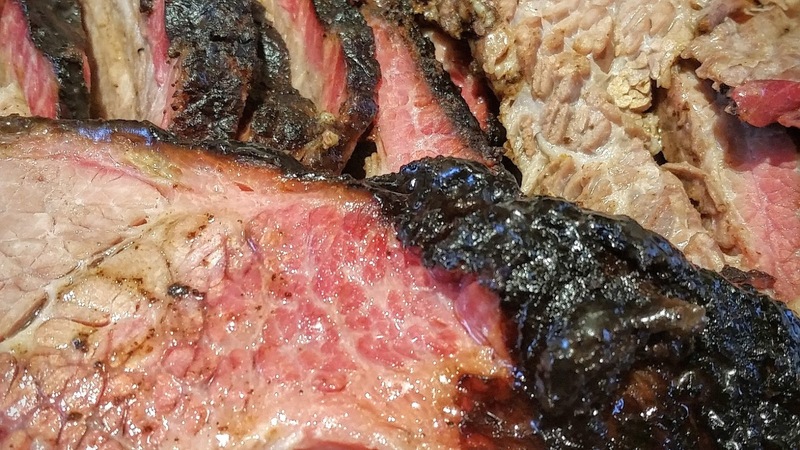 If you serve a sauce, people feel compelled to put it all over the precious brisket. Most times I do not put out sauce, but if I do, I puree and strain it and then put it in a squeeze bottle with a very small orifice. If they want to douse the meat with sauce, they will have to work for it. There is rarely leftover brisket, but if there is, it is great in panini, repurposed as carne asada tacos, or even with chow fun noodles and fermented black beans. PS: I did build the Porkulator and got all of the things from my home list done in five weeks. It’s good to have friends like Jim to help keep priorities straight.